I created a version of waffles for me. Combine dry ingredients. Add in milk, oil, and egg yolk. Whip the the egg white and fold in waffle batter. Bake in waffle baker. For a short cut you can just add the egg whole with the wet ingredients. These waffles did turn out a little more dense that I liked, but that may because I added 1/2 whole wheat flour. We are in the process of moving and I wanted to us up some of the whole wheat flour. Hi Julie. I think you should add this to my Monday recipe linky party. :-) I love waffles. I don't make them often enough. Thanks for participating at Joy of Desserts. 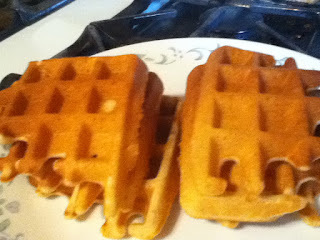 I love waffles...these sound fantastic! Can they be for me, too?